"Connie helped us develop some very unique ideas for our Save the Date and Wedding Invitations. She provided excellent and insightful design recommendations as well as outstanding quality of service with our final invitation package. Our guests gave us countless compliments on Connie's work--we couldn't have been more thrilled to work with her!" "Articulations made our wonderful vintage monogram style wedding invitations with matching stickers for our favors. Connie created the most beautiful and elegant design! Everybody loved it! She is extremely creative, accommodating and very personable, especially with the numerous requests and changes we applied to create the final layout. I have worked with her closely during the entire process and would not hesitate to do another project with her. . . I would highly recommend Articulations to anyone." "I am absolutely obsessed with all the personalized stationery that Articulations has designed for me. Even despite approaching Connie & Beth with a vague sense of what I wanted, they were extremely patient and collaborative in the design process. The end result was phenomenally executed and exceeded my expectations! I sing their praises to all my friends and recommend them time and time again." "Beth and Connie were such a pleasure to work with! They met with me face-to-face, gave helpful guidance that helped me develop my creative vision without deciding for me, and were flexible and timely with my order. Of course the stationery turned out beautifully and dazzled my wife for a truly memorable anniversary!" "We simply loved working with Articulations. Connie and Beth were a pleasure to work with--always quick to respond to an email and more than willing to provide us with guidance and advice, including etiquette and cost-saving ideas. We had many guests to our wedding comment on how beautiful, tasteful and classy our invitations were." "Our many thanks for your creativity and attention to detail. We love our wedding invitations—they are exactly what we envisioned—and working with both of you was nothing short of remarkable. I can’t wait to get started on the Christmas cards!" "It was wonderful working with both of you . . . I appreciated working with someone personally and knowing that I could touch base regarding any questions or ideas. I knew I wanted something unique and beautiful to announce my wedding and invite my guests, but I was unsure what it would look like. Thanks to your help, we came up with the perfect combination of my vision and what was doable. 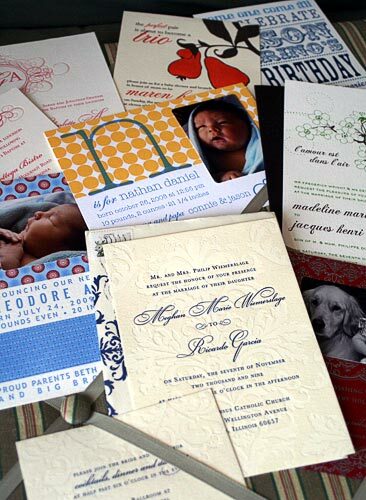 . . Lastly, I received more compliments on my save-the-dates, invitations and programs than I had ever expected. Thanks ladies for making my wedding more meaningful and special!" "Everytime we work together, your cards manage to capture exactly what I want to say with such class and style. From silly Christmas cards to classic baby announcements, I’ve always been excited to send them out and delighted to hear the response. Your process covers all the bases, and I truly appreciate your attention to the nitty-gritty details. Your discussion for each design is thrilling and you always make me feel like a part of the team. Thank you for your creativity and for delivering a product that represents who we are every time." "Thank you Articulations for the beautiful baby announcements for Liam! I can’t tell you how many compliments I have gotten on them from my friends and family. I appreciate you working with me to design such beautiful cards in advance of his birth so that it was easy to get them printed and out the door once he arrived." "It has been such an enjoyable experience to work with Connie and Beth. They made sure that they understood what I wanted and delivered a design and finished product that exceeded my expectations each time! They have been very responsive to my needs, always met my deadlines, and delivered an exceptionally high quality and unique product. Every time I send out an Articulations print item, I receive many calls and emails from impressed friends!" "I was planning a small, intimate wedding in Northern Michigan and I wanted to make sure my guests felt comfortable and welcomed. I thought I could put together my own little welcome letters, wedding programs, and place cards, but my need for perfection and attention to detail got the best of me. . . When I met Connie, I couldn’t have felt more comfortable or at ease. . . She took time with me, offering her ideas, and I never felt rushed or pressured into making on-the-spot decisions. I found confidence in her professional work. I also observed her own sense of style, and I liked the clean, simple, understated elegance of her portfolio. Connie put together my wedding programs, welcome letters and personalized place cards in a timely manner. We received innumerable commendations and compliments on the beauty of our letters, programs and place cards. . . My husband and I couldn’t have been happier with the professionalism and friendliness of Articulations. I will always contact Articulations for future needs." "We love how everything turned out and appreciate all the time and effort you put into making our wedding extra special!"